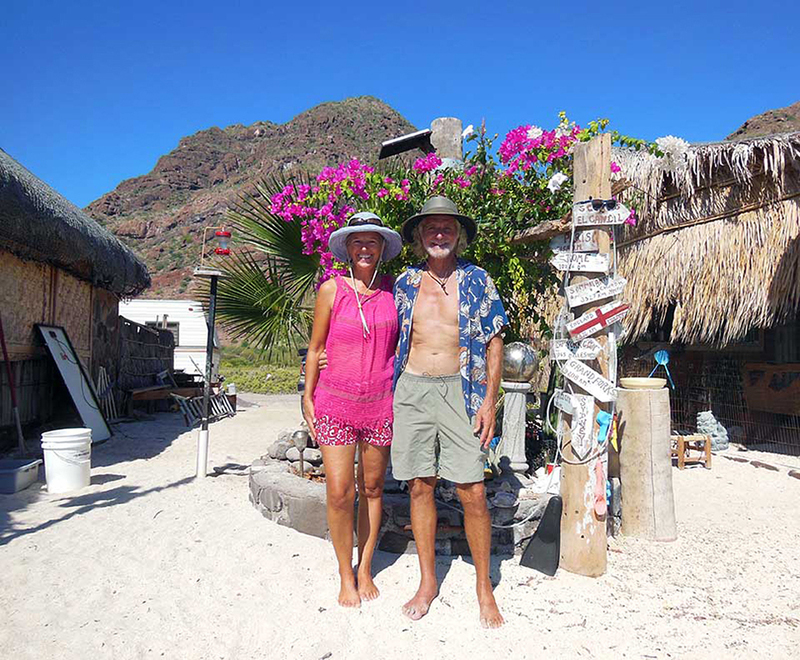 After more than a month in Puerto Escondido, we were very excited to be "on the road again"--staying in uninhabited anchorages with no services or amenities for miles, and where we were often the only boat. Nothing around us but nature, breathtaking sunrises and sunsets, Caribbean-blue-green waters, stunning tropical fish, sea turtles, whale sharks, and dolphins...THIS is why we are cruising! If only our cameras would cooperate and we could capture more of it. Heidi's DSLR Nikon is having a focusing issue, and Kirk's is having a chip corruption issue. First-world problems we know, and luckily our OLD point-n-shoots, iphones and GoPro do an OK job, but we're hoping to get our good camera equipment fixed soon for more great pix. 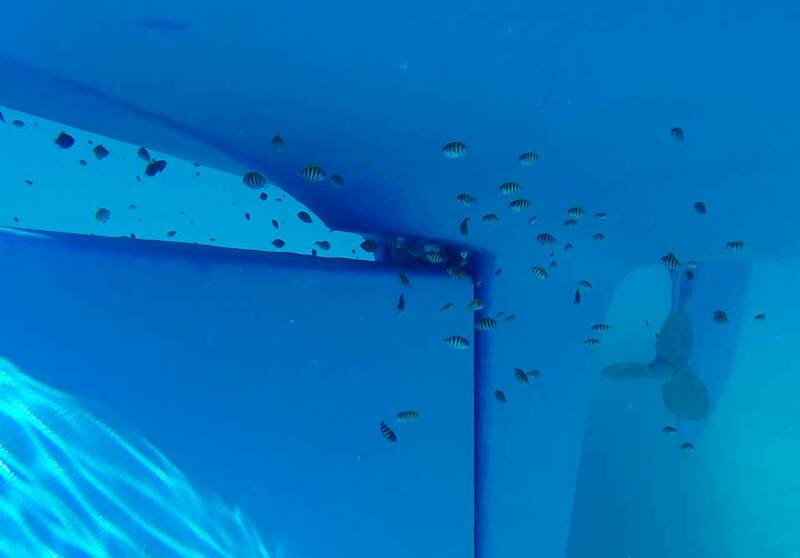 The Sergeant Major is the most ubiquitous tropical fish in Mexico and we've seen them everywhere, ranging in size from about 3" to 8" long, but had never seen teeny-tiny babies before. There were hundreds of them swarming around our rudder and under the keel, all about ½-inch to 1-inch long. SO cute!! 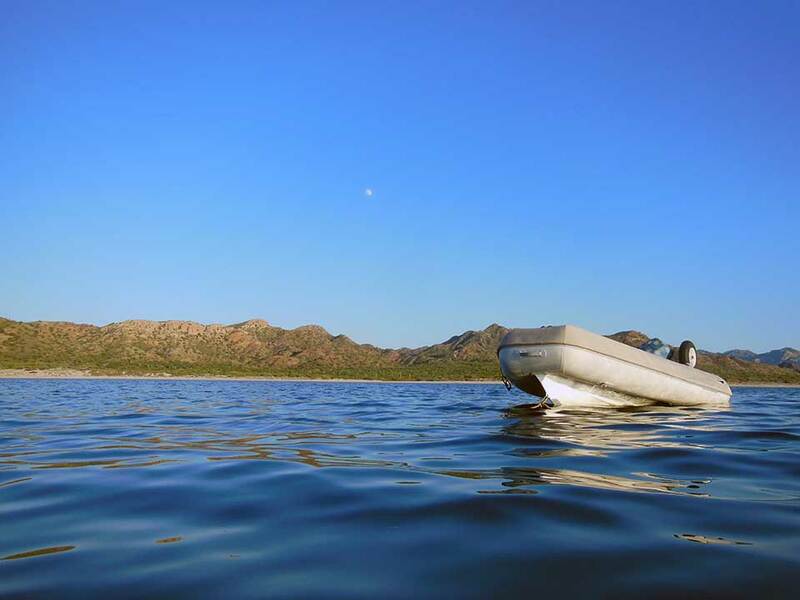 From Loreto we headed northeast six miles to Isla Coronado where we met up with s/v Ingenium again. 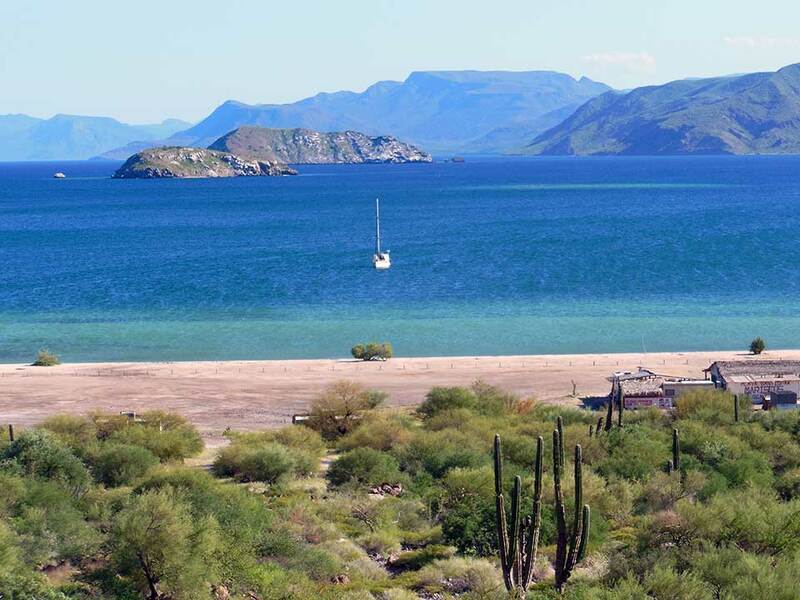 We first visited Isla Coronado three years ago when we rendezvoused with some of Heidi's family for Thanksgiving in Loreto. Back then we took a panga ride from Loreto to Isla Coronado for the day and toured the island, checking out the sea lions, blue-footed boobies, frigate birds and pelicans, plus playing on the beach and in the water with niece Annika and nephew Tate. 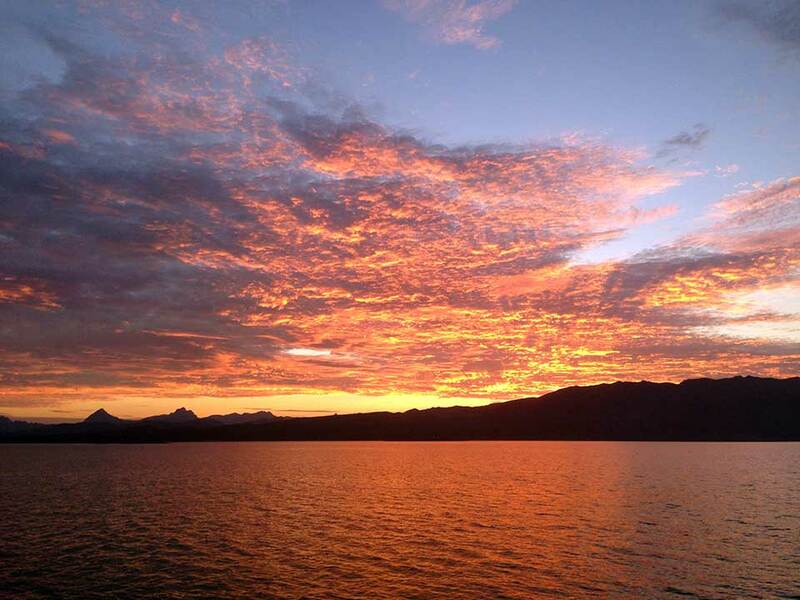 This sunset at Isla Corado looking back towards Loreto was one of the most spectacular we've seen yet. This time around, the crystal-clear turquoise warm water was so inviting we never made it to out of the water and to shore in the two days we were there. We swam and lounged in the water a LOT (YAY for pool noodles!) But sadly the snorkeling was not that great at Isla Coronado. Hurricanes often disturb the undersea areas as well as the land and it's possible that our friend Newton disturbed things here too. The sunsets were spectacular though--and the starlit nights have definitely cooled down to a reasonable sleeping temperature again. San Juanico is a treasure-trove of rocky islets, pinnacles, and shoals great for snorkeling and kayaking around. Always on the lookout for whales and dolphins, we continued north to San Juanico, without seeing much marine life at all. 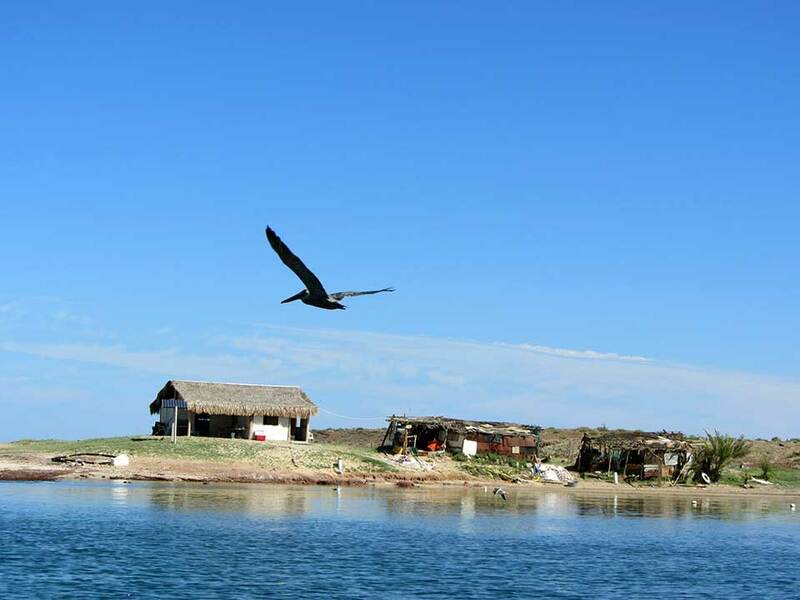 But San Juanico has an amazing array of geologic formations including lots of obsidian, as well as beaches to walk, rocky islets, pinnacles, and shoals to snorkel and kayak around, hikes ashore, and several anchorages within the big bay. There were also a few new large homes overlooking the bay accessed by a seven-mile dirt road to Mexican Highway 1. We took a hike along the dirt road (full of "Apache Tears", small pieces of weather-worn obsidian) across the isthmus to skinny dip at gorgeous, secluded La Ramada Cove. 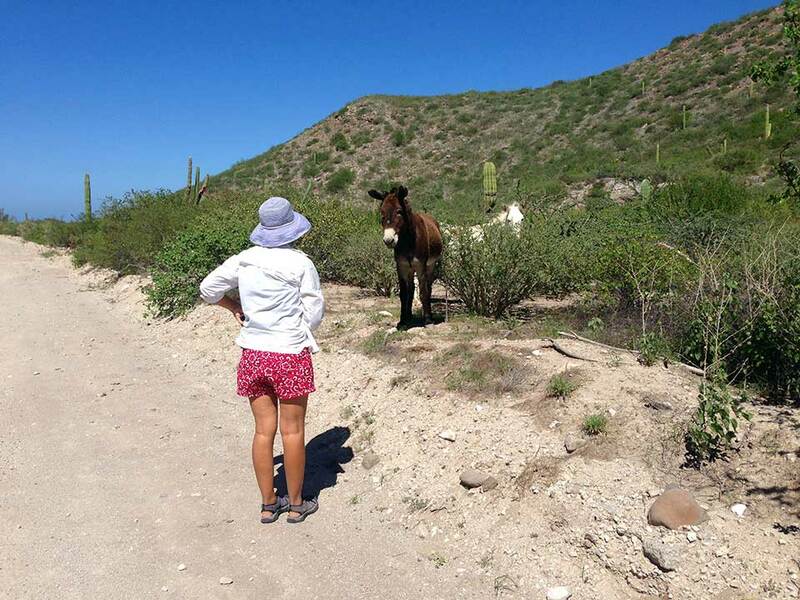 Heidi tried practicing her animal communication skills with the burros at San Juanico. No comprende... Kari, this one's right up your alley. We encountered several horses, mules, and burros foraging along the road too. Curiously, the burros were among the first we've seen since we arrived in Mexico almost a year ago. When Heidi visited Mexico with her family as a kid, she recalls there were burros everywhere. Maybe they are more common on the mainland than in Baja, or maybe they've since been replaced by cars, ATVs, and trucks? Anyway these burros were cautiously curious and cute. On the way back we stopped by the Cruiser's Shrine--a small tree on shore that has been decorated by sailors for decades with name-boards, rocks, shells, and flotsam, inscribed with boat names and dates of visit. It's similar to the one on Wallace Island, B.C. if you PNW sailors have been there, but this one is much smaller. 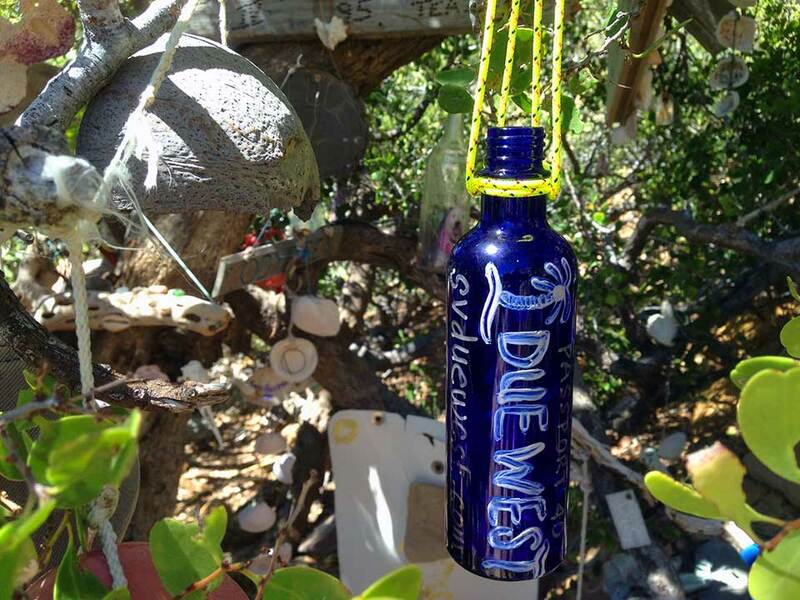 We painted a palm tree and "Due West" on a blue Neal's Yard Remedies bottle, and hung it from the tree. Due West's "name board" (a Neal's Yard Remedies blue glass bottle!) added to the Cruisers Shrine in San Juanico. In spite of it's remoteness (or maybe because of it!) with no stores, restaurants, or shore-side amenities, there's so much to do in San Juanico we could have stayed here a month and plan to come back in November. Unfortunately s/v Ingenuim was having ongoing engine issues and opted to head for San Carlos at this point. We'll catch up with them again when we get to San Carlos ourselves, and we hope they get their engine fixed soon! It was a long 8-hour day of motor-sailing north to Bahia Concepción again with no marine life. 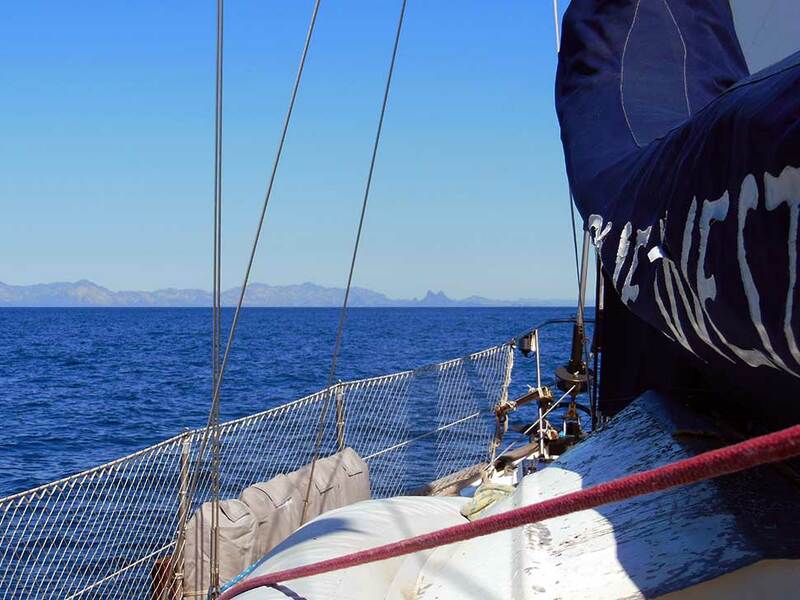 Sadly, some of our good cruising friends have noticed a significant decline in marine-life over the past twelve years that they've been sailing the Sea of Cortez...Pollution? Climate change? No one knows for sure but it's No Bueno! Bahia Concepción is a long narrow bay (20-miles long by 2-to-5-miles wide, about the size of Lake Washington.) 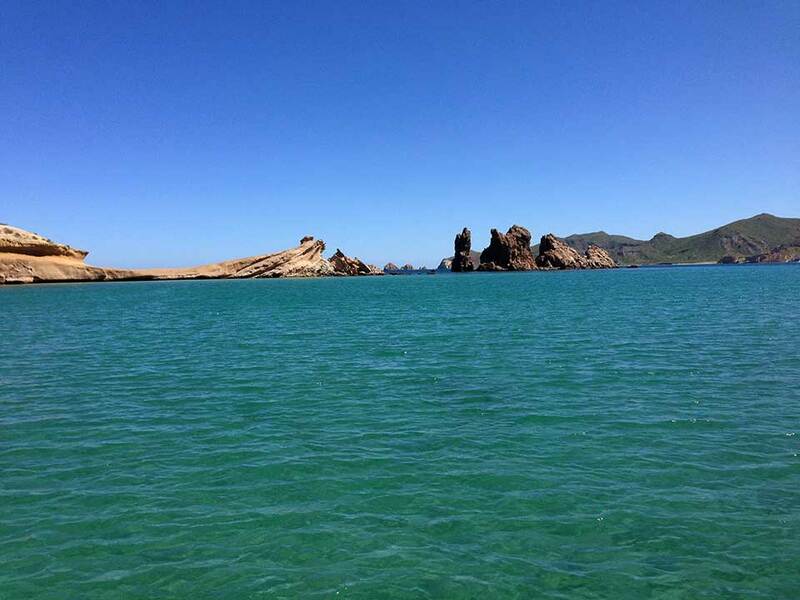 Our first stop was at Santo Domingo at the northern tip, across the bay from Mulegé (moo-la-hay). There's a great shelling beach along Bahia Santo Domingo with a fishing camp at the north end of the beach. Santo Domingo also happens to be just across the bay from the TelCel tower that serves Mulegé, and we had 5-bars of coverage for the first time since leaving Loreto. This is the only cell coverage in the bay, so Heidi got right to work on her graphic design projects plus keeping up with her Neal's Yard Remedies business. It's such a catch-22, we love to be unplugged and remote, but since Heidi is still working (saving the planet one blue bottle at a time!) we need semi-regular connectivity. Our "other boat" (car!) our awesome RIB dinghy "Aventuras" bobbing in the water in Bahia Santo Domingo with the full-moon over-head. Two days later we headed for our long-anticipated anchorage at Bahia Santispac, six miles south into the bay. We had also camped on Santispac Beach with Heidi's family, and sitting around the campfire three years ago we dreamed of bringing Due West back here one day soon--and so we did! Andy, Arne, Teresa, Annika, and Tate: you guys would hardly recognize this place now! The open palapa shacks we stayed in have all been torn down and replaced with more robust 3-walled-2-room palapas (still only $150 pesos a night, a whopping $9 US.) Plus there's a house on the beach right behind where we camped! Anna's restaurant is still there as well as a new restaurant and bar called Armando's with live music closer to the palapas. What a difference three years makes here, but it was great to be back! Playa Santispac beach, one of our favorite spots in the Sea, has been improved quite a bit since we camped on the beach here three years ago. Great to be back anchored offshore! Andy, when we saw the Westfalia we almost thought it was YOU! In the Caribbean there are "boat boys" selling everything from handicrafts, to t-shirts, to food. At Bahia Concepción there are "truck-vendors" plying the beaches with the same type of items from the back of their pick-up trucks. Much to our surprise, the first truck-vendor we met was Paleo, the same guy who had custom-made our blue macrame fruit-hammock three years ago! The original hammock was a bit too small for all of our produce, so we commissioned Paleo to make us a new, larger one. Being off-season, he was low on string-colors, so we got "Rasta" (green/red/gold). Mucho major! It fits perfectly and looks great with the original blue one. 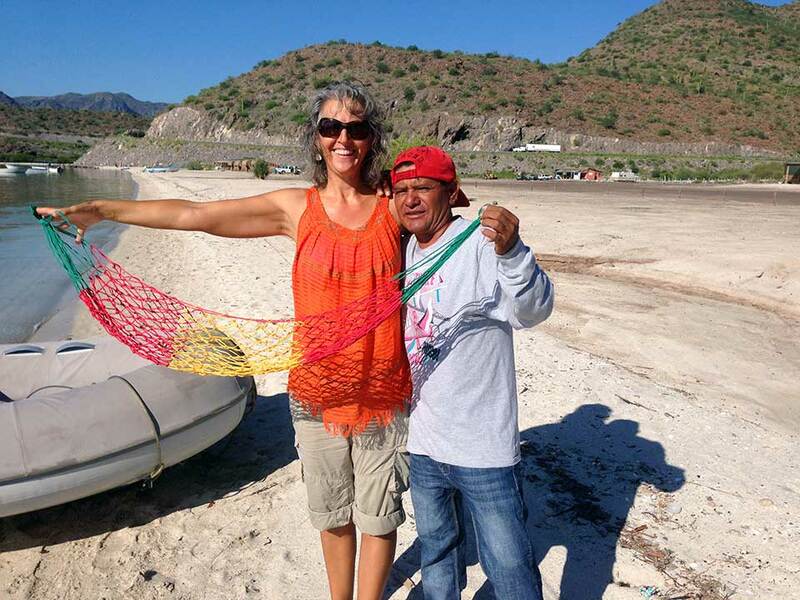 Heidi also bought two hand woven/embroidered tops that Paleo imports from his home town of Mitla near Oaxaca in south-central Mexico. Mitla is also home of one of the most well preserved Zapotec archaeological sites in Mexico, and we plan to visit Mitla and Oaxaca when we get further down the coast. Heidi has great memories of visiting both towns as a kid and is excited for Kirk to experience them too. Heidi wearing one of her new shirts with Paleo and our new produce hammock. Fun to run into the same beach vendor three years later! The next day Paleo was our "taxi" ride into Mulegé, the nearest town and services 10-miles away. We needed to provision as we were completely out of fresh produce for our new hammock as well as our bellies! 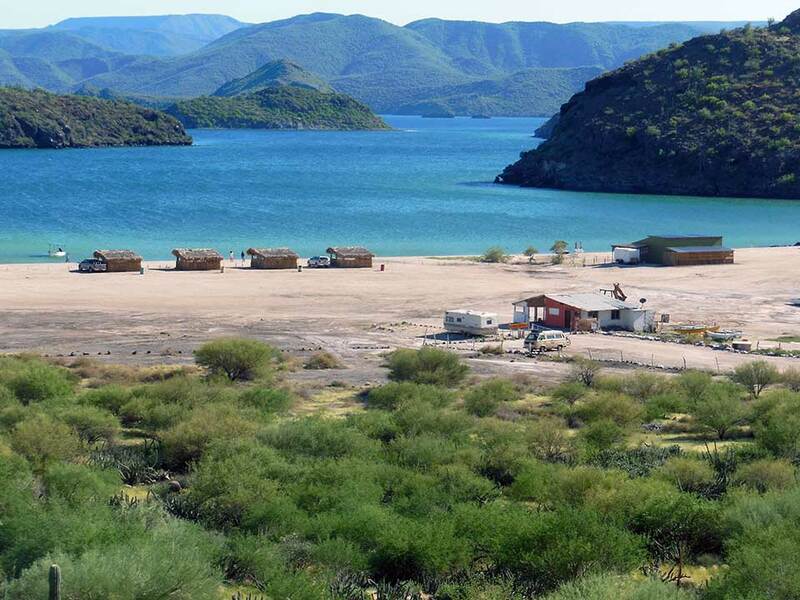 Mulegé is a cute, small town at the mouth of the Rio Santa Rosalia that is often hit hard by hurricanes. We loaded up with produce (in a great Frutas Y Verduras mercado behind the fire station) and Paleo also gave us some fresh limes and lemons from his trees. After produce shopping we hiked up the stairs to the town's museum, formerly a work-release prison built in 1907 and in use until 1974. 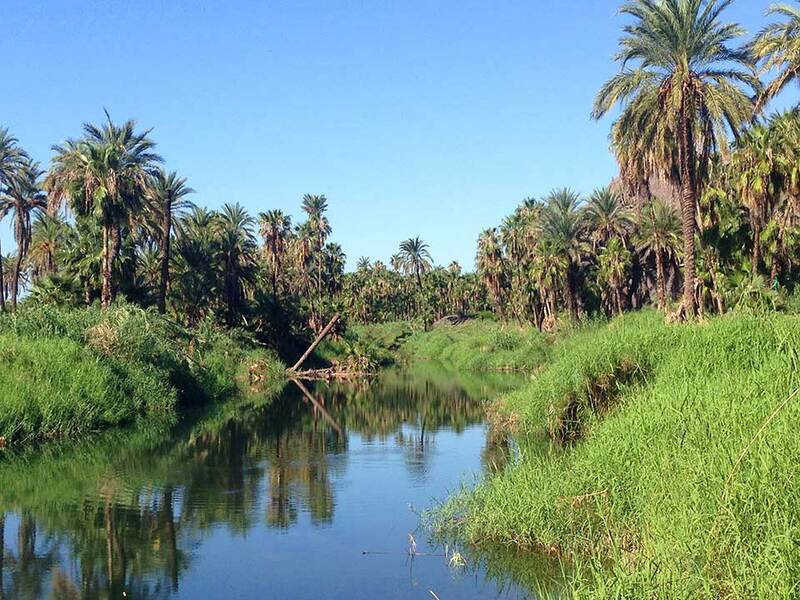 Palm trees along the Rio Santa Rosalia at Mulegé. Our tour guide spoke Spanish, and though ours is getting better we probably only picked up 50-75% of what she said. Still we got the gist. It was a work-release prison for both men and women. They rang a bell at 0600 (6am) when the prisoners could leave and go to work for the day. Then rang a bell again at 1800 (6pm) when they had to be back for roll call and into their cells for the night. The women's rooms were separated from the men's rooms, but no rooms had doors or bars on them, nor did the bathrooms have doors. And there was another inclosed section for the violent and crazy prisoners (who were not let out) who were all locked up together, again no doors on their rooms?!? In theory, this is a satellite that landed in a nearby farmer's field. Question for JGC, our resident Rocket Scientist: does this REALLY look a satellite?!? If so any idea of era? There were no markings on it to indicate USA, USSR, UFO...? 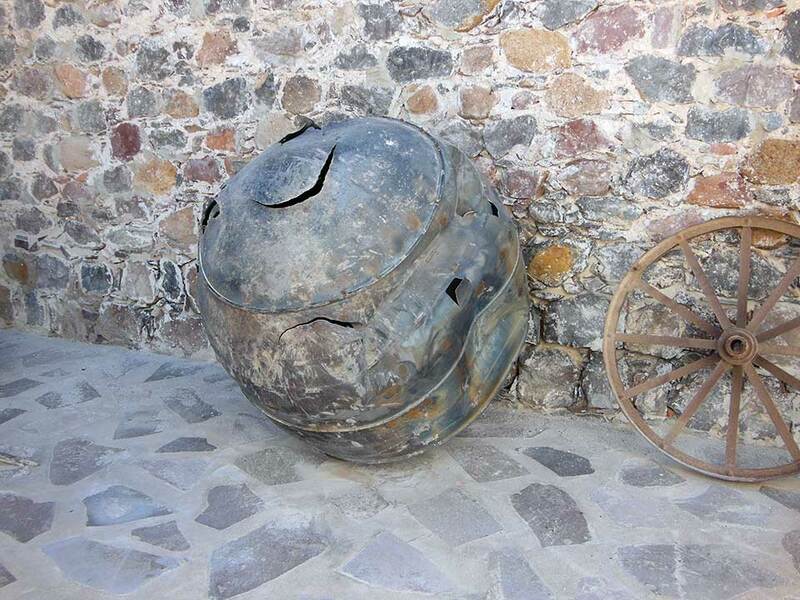 Juxtaposed with the old wagons, cannons, and guns, the weirdest thing was an old satellite, in the corner of the prison that had apparently fallen out of the sky and landed in a nearby farmer's field?? It looked very 1950's. No identifying marks, was it US? Soviet? UFO? Who knows... was it even a satellite? It looked more like a diving bell. 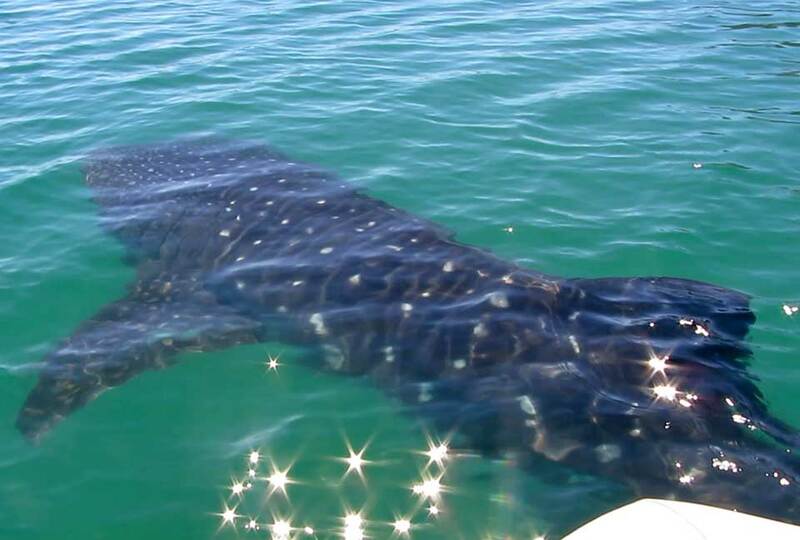 Cool Animal Sighting: Another highlight of the Playa Santispac anchorage was seeing the resident whale shark! A 15' juvenile, we tried to snorkel with it, but the water was so rich with plankton and fish-spawn that we couldn't see more than a foot or two in front of our faces. So we hopped in the dinghy and rowed over to it. It was swimming with it's big, wide mouth at the surface of the water, and we got some nice views of it alongside and under! our dinghy. SO COOL!! The whale shark hung around the bay all three days we were there, such an amazingly beautiful creature and fun to watch. Our crazy furbies! 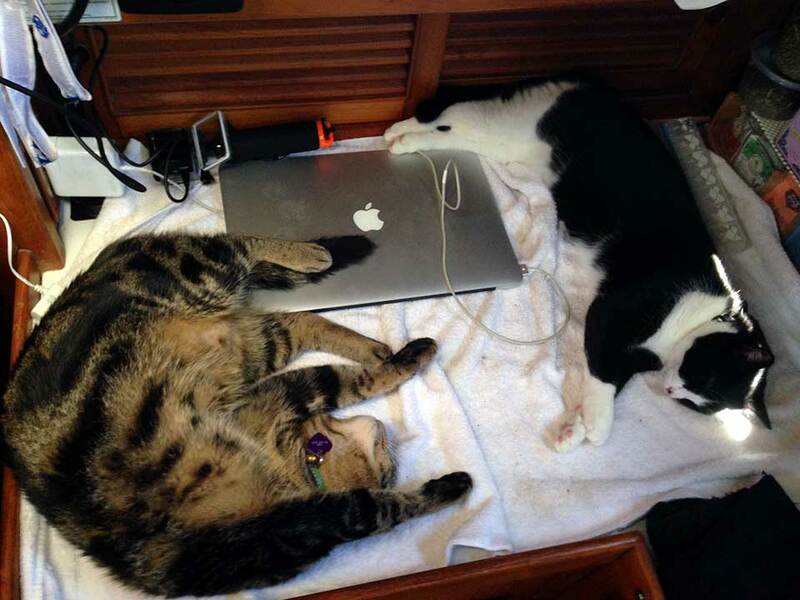 Besides eating moths and flies, Tosh is partial to getting as many EMFs as he can by sleeping on top of computers and other electronics while they are charging?! And Tikka seems to love bleach?! It's like cat-nip to her, we have to keep her far away on the rare times we use it. Loco gatos del mar! But we love them dearly, they keep us in stitches with their crazy antics! And speaking of amazingly beautiful creatures, Tosh and Tikka have been having a hay-day chasing the giant moths that visit our cockpit lights at night. In fact, Tosh who seems to be perpetually food deprived (yea, right! ), has taken to supplementing his diet with giant moths...yum!? And Tikka has become quite the fly-catcher and loves to gobble them down too. (The downside to Playa Santispac, mucho moscas (flies), NO bueno!) Captain Kirk has also taken up the battle of the flies with our electric fly-swatters, and now thinks like a fly so he can zap them! Heidi wants to know if it's bad karma to kill flies and mosquitos? Due West anchored in Playa El Burro, home of Geary Ritchie who gives the daily weather forecast for cruisers on the Sonrisa Net (note the HF radio antennas on his house!) Geary also plays Amazing Grace at about 100 decibels at 0800 each morning after his WX report. After three days at Playa Santispac we continued three miles south into Bahia Concepción to another highly anticipated anchorage at Playa El Burro. 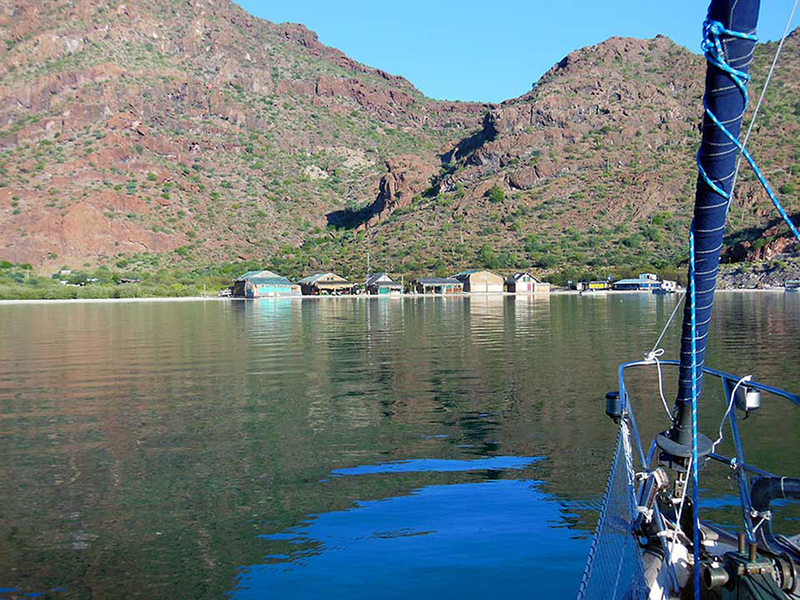 This is the home of the famed Geary Ritchie, the Sea of Cortez weather forecaster on the HAM Sonrisa Net each morning. Geary has been dispatching weather forecasts to cruisers in the Sea of Cortez for about 15 years now, and due to lack of internet and cell coverage up here, his morning WX forecasts on the HAM/SSB are often the only way to get the all important weather forecasts each day. On the beach at Geary's Grotto, El Burro Cove. We had planned to be here for Geary's big 4th of July cruisers party which we've heard about for years. But if you've been reading our blog long, you know how our plans go... or not! So we're only 3-months behind visiting with Geary, LOL...Great fun to finally meet him in person and to connect a name with a face after hearing him on the radio for the past year. He regaled us with stories of Playa El Burro in the "old days", over the past 20 years, and gave us a good picture of what it's like to live full-time in a small Mexican community. THANKS Geary for the visit and all of the WX forecasts. Due West hanging out in Bahia Concepcion. Can you say LOVE LOVE LOVE Bahia Concepción!? We could have stayed here for a month or more... but Heidi's work was calling and we had to head back to the 5-bars of connectivity at Bahia Santo Domingo. And you know us...we always have things to do, places to go, and people to see: across the Sea to San Carlos, then up to the states, a 5 hour bus ride to Tucson (to renew our visas and visit family), down the road in La Paz (for Thanksgiving with Seattle friends), then back across the Sea to Banderas Bay/Puerto Vallarta (for the Festival of Guadeloupe) in early December. Phew! Recall our "plans" are written in sand at low-tide...so we'll just see what pans out. This post was written as we motor-sailed 70+ miles (in 6-8kts of wind from the northwest) across the Sea to San Carlos. We left Bahia Santo Domingo at o'dark-thirty (0400 am) on Friday morning. With Tetas de Cabra (twin peaks of San Carlos) in our sights most of the way across. 13-hours later we had hook-down by 1700, and met up with Boni & John (s/v Ingenium) and Lisa & Don (s/v Windcharmer) for dinner. It was like old home week here meeting up with lots of cruising friends who are gearing up for winter-season in Mexico.